From the Chart of Accounts (accessed by going to Settings > Chart of Accounts) you can enable several advanced options. Do this by clicking the Show advanced configuration options link at the bottom of the page. Access to nominal codes – Ticking this option will show all your nominal codes in all areas of KashFlow. For example, you can select a sales type nominal code (which is normally used in an invoice) as a purchase outgoing type on a receipt. Please note: This option should nearly always be left unticked and shouldn’t be used without the guidance of your accountant. This is because using an incorrect nominal code in the wrong area will affect your reports. 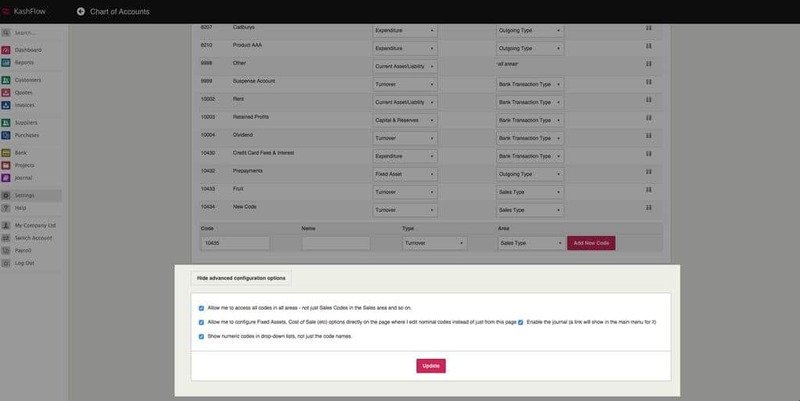 Configure nominal codes – This allows you to set the nominal codes type from within the nominal settings rather than only on the Chart of Accounts page. To avoid setting a nominal code incorrectly by accident this should normally be un-ticked. Enable journal – Ticking this option will enable the journal area of KashFlow. The journal area allows you to transfer an amount or balance of a nominal account to another. Again, the journal should only be used with the advice of your accountant. Codes in lists – Ticking this option will show the nominal code number in lists as well as the name. For example, instead of just ‘Sale of Goods’ showing in the list, it will be displayed as ‘4001 – Sale of goods’. When you’ve made your changes click Update to save them.